We originally purchased the full length version of the Throntail for the TWS handgaurd which worked out awesome because the TWS Handguard is so long, more like an AR handguard. When we ditched the TWS for an Ultimak, the full length Thorntail was a little long and forces you to move it back towards the red dot a bit. Not a big deal but the SBR version seems to be out of the way a little more on an AK. 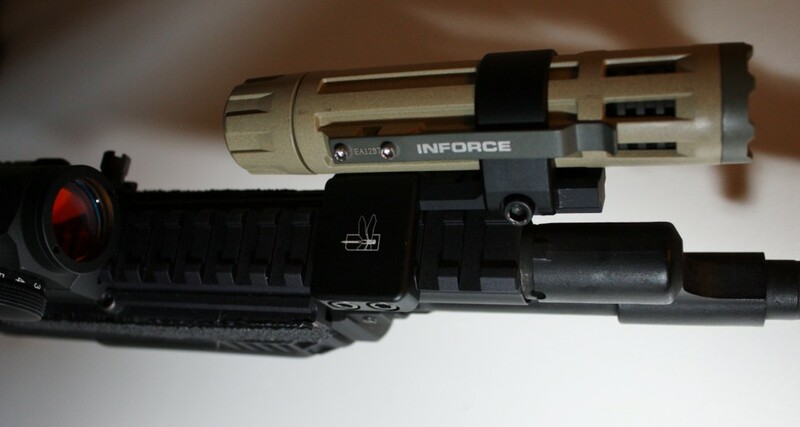 Impact Weapons Components (IWC) was cool enough to let us purchase just the shorter SBR rail (only difference between the two) to use with my existing Thorntail components. 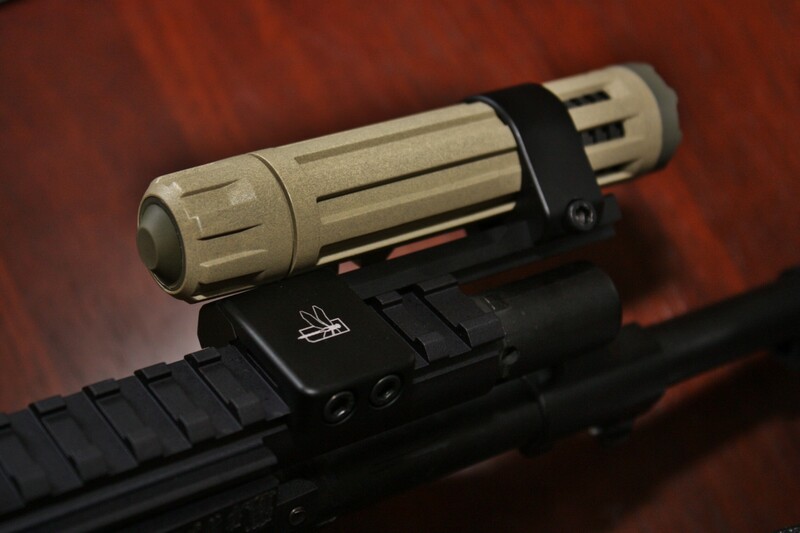 The SBR rail is a little over inch shorter and allows you to get the light in the perfect spot when using an Ultimak. The light we choose to pair with the Thorntail is the INFORCE 6vx (review in the works) due to its 200 lumen LED and multi-function cap switch. The cap switch easily allows you to switch from momentary to constant on – high, low, or strobe. The light has a sleek slim design and weighs in at only 3oz. The 6vx is made of a rock solid polymer that from are testing takes abuse well. The two are a great low profile pair that line up perfect with an AK & an Ultimak. The Thorntail is made up of three components; the locking mechanism that attaches to any 1913 Picatinny rail, the extender rail, and the light mount ring. The rings come in three sizes; .830″ for executive series lights like the SUREFIRE E-Series, a 1.000″ for lights like the INFORCE, most SUREFIREs, or ELZETTAs. 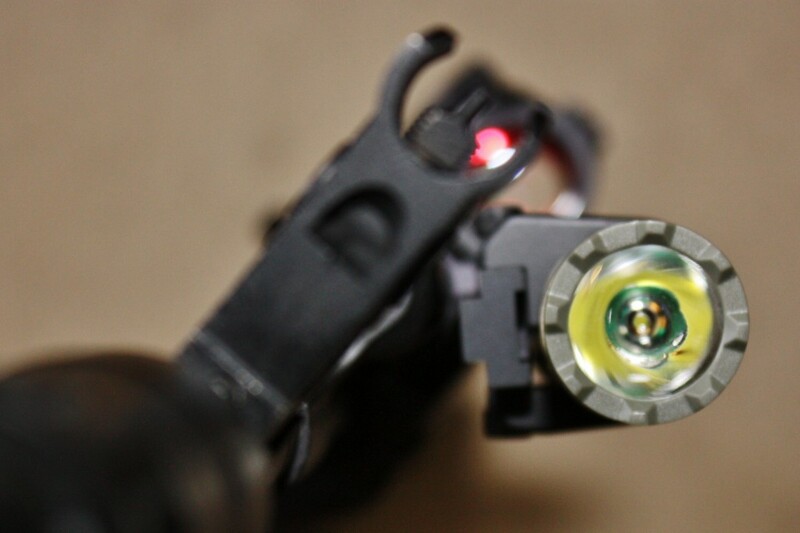 And they also make a 1.030″ ring for the SUREFIRE G2 set of lights (nice option for those with the old school G2). The locking mechanism screws into the extender rail with two machine screws. Then the ring attached to the end with two smaller machine screws. The Thorntail comes complete with instructions and the tools you need to attach the light to your rifle. Once the mount is assembled it is rock solid. The whole install takes about 5 minutes. The slowest part is dialing in exactly where you want the light to be at. With the SBR Thorntail on the Ultimak, all I have to do is move my thumb up a half inch and the light switch is right there. It is the perfect setup for a light on our AK. 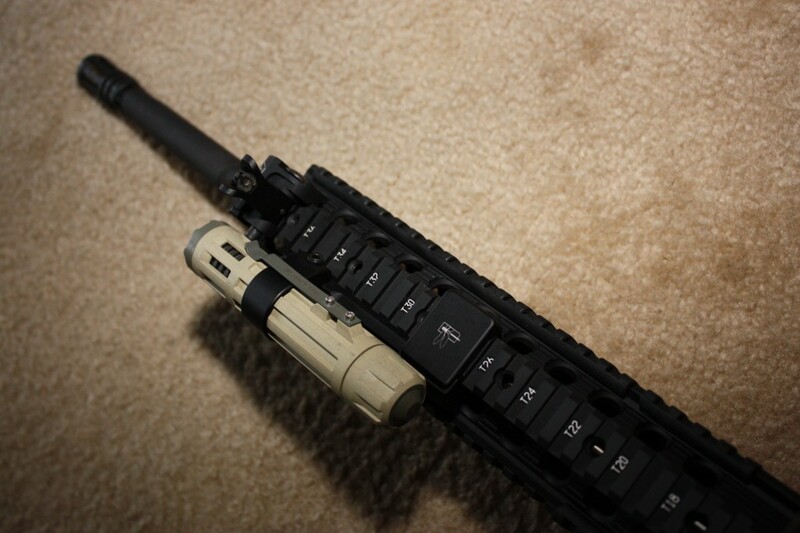 The idea of the Throntail (excerpt from IWC’s webpage) is to “extend the weapon light out several inches beyond the end of the forend or rail system allowing the shooter to place the support hand farther forward on the weapon, improving the shooter’s control, speed and accuracy while increasing usable space for attaching IR devices, lasers, grips, etc”. 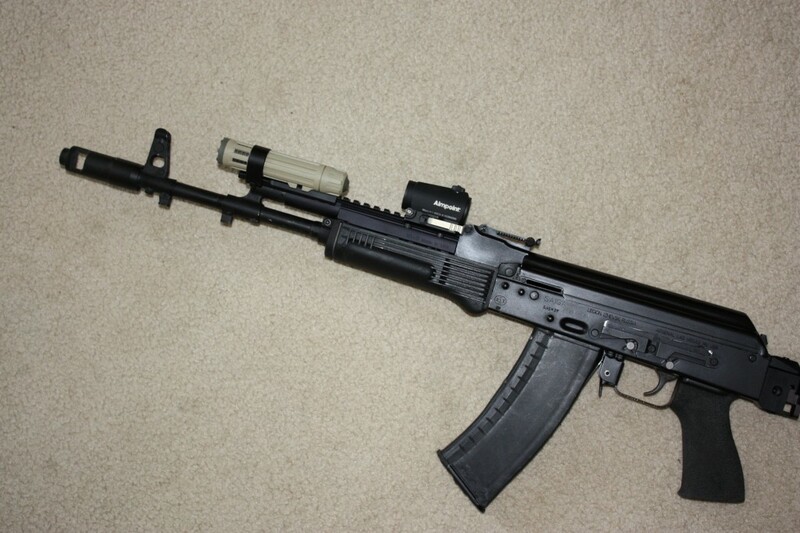 This is very important on an AK as you don’t have a ton of handgaurd space to work with, especially if you are using an Ultimak with the stock polymer handgaurds. This setup allowed us to fall in love with the Ultimak. You get a lightweight package that doesn’t disrupt the balance of the rifle along with the heat shielding of the stock handgaurds. Add red dot and light and your good to go. The Thorntail puts the light right where it should be and allows the user to completely dial in the light to their setup. The Thorntail also allows you to bring your existing light to the party so you can just add this as a new mounting system. We found the Thorntail to be solid. The SBR version is tight up against the Ultimak gas tube and depending on the light, does not extend far past the front gas block. I hope you can see form the pictures this is a super compact package. This allows for minimum surface area to snag or clip objects. We have been rough on the Thorntail and it has had zero issues. Along with the tough polymer of the INFORCE 6vx it’s really a very strong, ridged combo. The polymer of the 6vx takes impacts with just a dent and never any degradation to the light or the mount. At first we thought the mount might snag and if forced the aluminum rail may break. In our testing this was not the case and we tried. Once together this mount locks up as one unit and the machine screws get crazy tight on both the rings and the rail mount. On an AK the Thorntail is awesome and a great way to go. We have tried to mount lights in multiple configuration on an AK and this is the best we have seen. On an AR, the Thorntail is just stupefying because you have so many rails to work with. 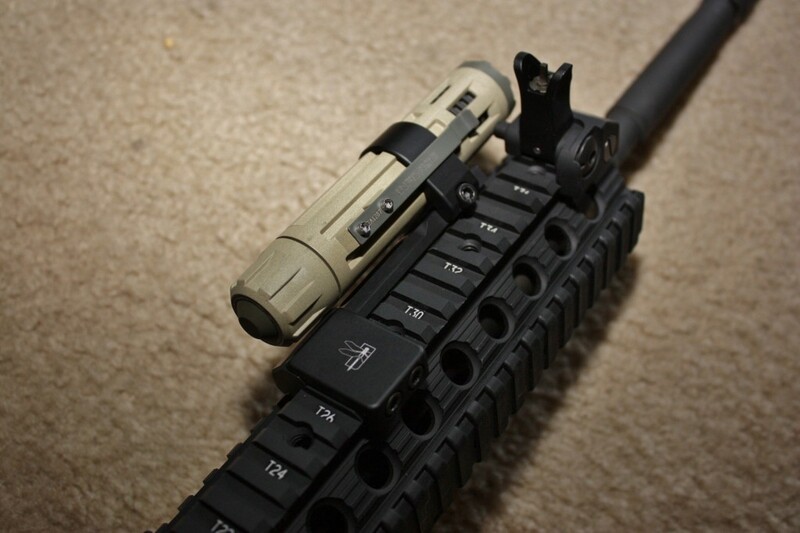 The mount is fully ambidextrous and provides 8 different mounting solutions on an AR. We threw this setup on a beloved M&P 15 and it was stellar. Again the light hugs the rifle and makes it a super compact package. If you have an AR and want to mount an existing light, check out the Thorntail as we think you will find a configuration that works with your setup, what ever that may be. At the end of the day, if you are setting up a battle rifle, we strongly believe that it should have a red dot and a weapons light. Up till now, if you have chosen that battle rifle to be an AK, it has not been that easy to do. No more! The Thorntail is an awesome answer to this conundrum and one that we highly recommend.